I don't normally post about giveaways, but I want to win this one, so I'm trying to gain as many entries as possible!! There is a wonderful Teak Loveseat Giveaway over at Confessions of A Semi-Slacker Mom. 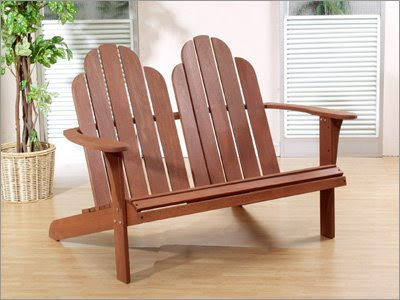 It's an adorable adirondack double seat and I'm entering because I would love one for my back porch next to the pool. A great place to plop with hubby at the end of an evening and enjoy the cooloer summer night air. csn Futons to see if they have anything worthy of our playroom. It seems that they have plenty of options. In other news, I've been in a blog slump. Well, sort of. I've had plenty to talk about and post about, I just haven't had time! We've been cleaning fans and baseboards, ledges and curtains (well, I've been cleaning them while everyone else plays in the pool, but that's okay, I get the job done uninteruppted!) We're still arranging and re-arranging and learning the whereabouts of things we've already unpacked, so it's been crazy in the Trent household. I'll get back to picture posting and craft displaying as soon as we get a little more settled. Until then, have a great day!